Photo credit: DonkeyHotey / WhoWhatWhy (CC BY-SA 2.0) See complete attribution below. 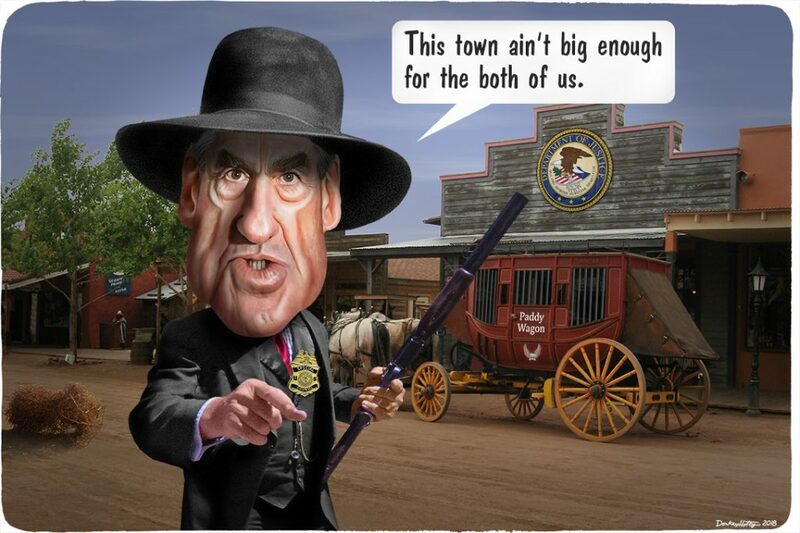 It is likely tons of ink and thousands of hours of airtime have been consumed by members of the media speculating on the contents and the timing of the Mueller report. That report has been submitted. Special counsel Robert Mueller’s job is over, and he can start golfing again. On March 24, Attorney General William Barr gave the public the bare bones of Mueller’s conclusions.Mueller decided there was no evidence that Trump or members of his campaign conspired with Russia to influence the 2016 election, but came to no decision about whether Trump was guilty of obstruction of justice. Members of Congress — particularly Democrats — are clamoring for the entire report, and underlying documents, to be publicly disclosed. The struggle to learn more will likely consume even more ink and air time. Granted, transparency is important. Mueller worked for nearly two years; indicted more than 30 people, including six former Trump aides and 26 Russians; and examined many facets of Russian interference. Earlier this month, the House voted 420 to 0 for a resolution urging Barr to release the full report, withholding only information that was barred by law from being disclosed. But it’s crucial that we don’t lose sight of what’s really important, and to keep in mind the limitations of Mueller’s charge. Last July, we published an op-ed by Klaus Marre that proved to be both prescient and wise. It still rings true. The following was published on WhoWhatWhy on July 22, 2018. Resistance dreams may never come true. Photo credit: DonkeyHotey / WhoWhatWhy (CC BY-SA 2.0) See complete attribution below. 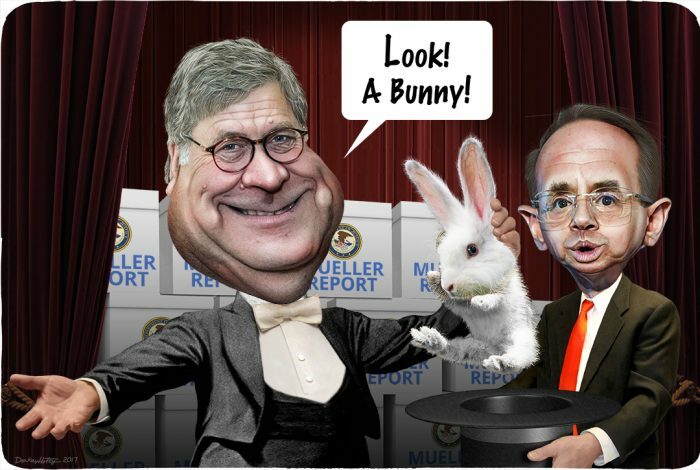 The cartoon above was created by DonkeyHotey for WhoWhatWhy from these images: William Barr caricature (DonkeyHotey / Flickr – CC BY 2.0), Rod Rosenstein caricature (DonkeyHotey / Flickr – CC BY 2.0), DOJ Seal (DOJ / Wikimedia), magician (Strobridge Litho. Co. / Wikimedia – CC BY 2.0), curtains (Ken Marshall / Flickr – CC BY 2.0), rabbit head (chrisinno / Flickr – CC BY 2.0), rabbit body (Will Keightley / Flickr – CC BY-SA 2.0), top hat (472301 / Pixabay), and white tie (Esquilo / Wikimedia – CC BY-SA 3.0).